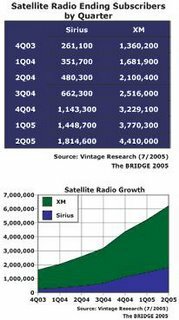 As excited as I am about digital satellite radio after seeing XM Radio in operation in the US, there’s little chance of a similar service being rolled out here. As my article in the Herald today explains, the local satellite players, chiefly pay-TV operator Sky and satellite wannabe Nzlsat which has been granted a slot to launch its own bird, don’t have satellite radio in their sights. Nor does IPStar, a subsidiary of Thailand-based Shin Satellite, which has one of the biggest commercial satellite’s ever launched positioned over the South Pacific. That satellite is capable of delivering two-way, high-speed broadband to the whole of New Zealand. IPStar’s New Zealand spokesman, John Humphrey was unavailable for comment before press time but I’ve posted some remarks from him below and excerpts from a useful report he sent me on the state of play in satellite radio in the flourishing US market. I guess I’ve been turned onto the idea of satellite radio through listening extensively to internet radio stations. I simply place my lightweight laptop beside my stereo, connect the two via an audio input and I’ve got the BBC World Service or any other station I want to listen to, piped through my speakers. That’s great when I’m at home, but radio is the companion of the traveler, the commuter. There’s a reason one of most popular segments of the radio day is “drive time”. That’s when everyone’s in their cars, a captive audience of hundreds of thousands. Satellite radio would let these people listen to a large selection of specialist stations. With companies like Audible specializing in spoken-word programming – audio books and talk shows, the traditional concept of radio is changing. In a mirroring of the pay TV model, smaller audiences are spread across a large number of usually commercial-free channels. Subscription fees are instead charged. Imagine that, continuous music uninterrupted by the inane banter of radio jocks. Alas, it’s not going to be that way here.